Wissy's blogspot: Value for money? Yesterday I went to Lords cricket ground in London to watch the Test match between England and Australia (more about that in a later missive). However two instances brought it home to me how much hotels and bars in London take advantage of their customers. 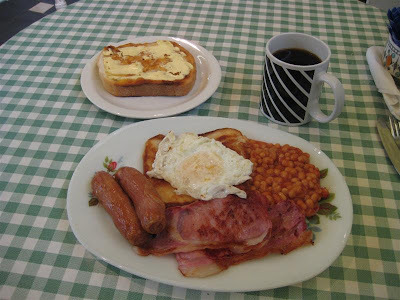 Whilst waiting to meet my fellow cricket pals and catch the train into London I decided to treat myself to breakfast at one of our local cafes. Being brave and putting any health concerns on hold I ordered the full English breakfast. This consisted of two rashers of bacon, two sausages, baked beans, fried egg, fried bread, coffee and toast. Fantastic, and all for less than £5.00. Excellent value for money I thought and very tasty! Compare this to my experience at lunchtime in London in a very mediocre bar in a large hotel close to Lords cricket ground. 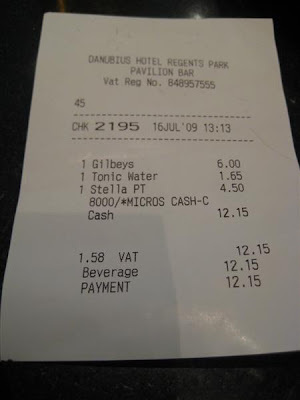 Ordering just an ordinary (and foul tasting) beer together with a gin and tonic, I was astounded to be charged £12.15! I appreciate that London is more expensive than elsewhere but I think that this is an absolute rip off. What do you think? I nearly fell off my bar stool whenI got this bill for just two drinks.